The Detroit Red Wings continued their strong start Tuesday night against the Tampa Bay Lightning. After defeating Toronto and Carolina last week, they carried the winning momentum into the game, winning by a score of 3-1. “It’s definitely an early measurement for us against a good team, an undefeated team, a team that’s got off to a great start, and is picked as one of the favorites,” said Justin Abdelkader. The game’s first half was an evenly matched defensive battle. Both teams clogged their opponent’s passing lanes and there were very few breaks for either side. Odd-man rushes were limited as neither team seemed to make a mistake. It would remain scoreless until late in the second period, when the Red Wings were able to capitalize on their second power play of the game. Following a great feet from defenseman Niklas Kronwall, Gustav Nyquist picked the top corner on goalie Ben Bishop, glove-side. Justin Abdelkader effectively screened Bishop on the play. Credit for the goal was then given to Abdelkader, but soon after it was re-awarded to Nyquist. In the third period, Detroit’s top line succeeded again, with rookie Dylan Larkin setting up Henrik Zetterberg in the slot. Zetterberg’s shot, much like Nyquist’s, featured skillful puck placement as it just fit under the crossbar. Larkin’s point brought him to four in three games. He is tied with Chicago’s Artemi Panarin and New York Rangers’ Oscar Lindberg. Additionally, his plus-six rating is tied for the league lead with six other players. Zetterberg now leads the NHL with five assists and seven points. Midway through the third period, Jimmy Howard’s shutout streak of 111.03 minutes was ended. Jonathan Drouin found Ryan Callahan, who ripped a hard slap shot over the glove of Howard. After managing only four shots in the second, Tampa recorded ten in the final stanza as they pushed to tie the game. Immediately following the goal, the Bolts continue pressing, nearly putting another past the Red Wings netminder. However, Detroit’s consistent defensive play stifled their efforts. With 1:48 left in the third, defenseman Kyle Quincey lifted the puck the length of the ice as Jason Garrison attempted to divert it away from the empty net. 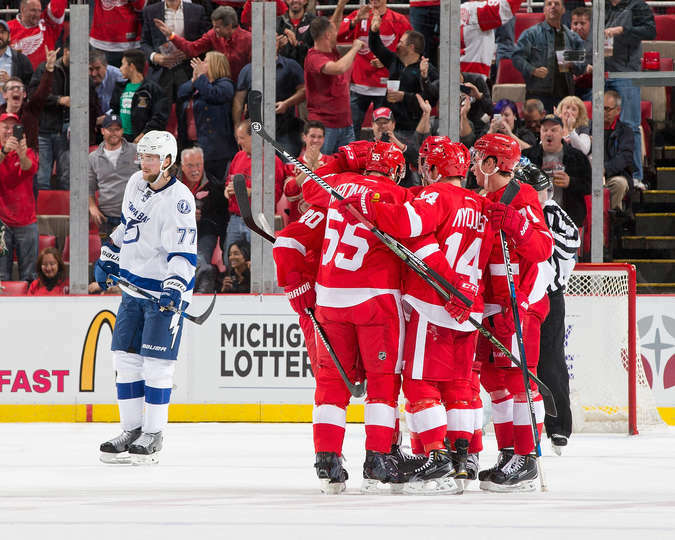 Detroit earned redemption after losing to the Lightning in seven games this most recent post-season. “Well, I think the name of the game tonight was playing with possession. I think we did that, you know, for the better part of the game, and you know, you can stifle them by doing that,” said Howard. Next Game: Friday, October 16 vs. Carolina Hurricanes. Forward Johan Franzen was a late scratch for this contest, as he was not feeling well before the game. It is unknown whether this is attributable to lingering concussion symptoms or now. Tomas Jurco drew back into the lineup in place of Landon Ferraro, but with Franzen’s absence, Ferraro was back in. Howard has earned a 0.50 goals-against average and .977 save-percentage, both of which are second only to Sharks netminder Martin Jones. Detroit out-hit Tampa Bay 26-11. Abdelkader led the way with six hits.